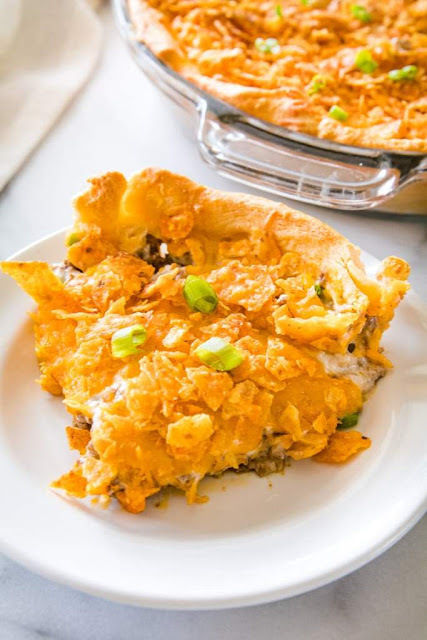 This delicious Taco Pie with crescent rolls recipe is made with a crust of crescent rolls then piled high with seasoned taco meat, sour cream, cheese and Nacho Cheese Chips. Taco Pie with Crescent Rolls is a recipe the entire family will love for dinner! As for the Taco Pie you are all wondering about. This recipe is simply awesome. It’s something a little different that every generation seems to love. 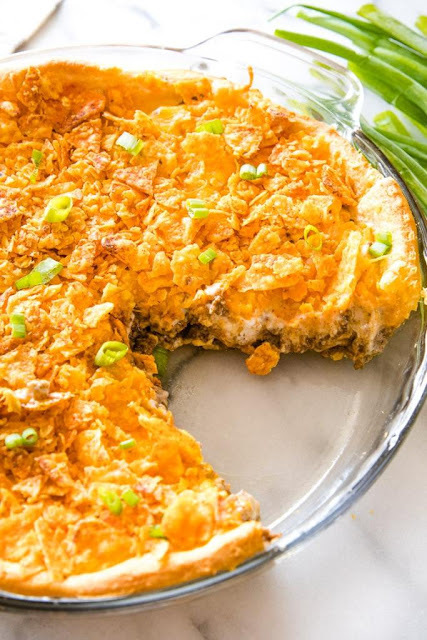 This Taco Pie with crescent rolls recipe is made with a crust of crescent rolls then piled high with seasoned taco meat, sour cream, cheese and Nacho Cheese Chips. It's a recipe the entire family will love for dinner! Brown hamburger. Drain excess fat. Add taco seasoning and water; simmer for 5 minutes. Place crescent rolls in a greased deep pie pan; flatten to cover bottom. Layer on the crescent rolls, the hamburger mixture, sour cream, cheese and crushed chips. Bake for 25 minutes at 350 degrees F.erent that every generation seems to love.